On Monday, August 21, 2017, a total eclipse of the Sun will be visible in the continental U.S. for the first time in almost 40 years. Remarkably, the total eclipse will ONLY be visible in the U.S. and no other country. The UNM Campus Observatory will be open 9:30 am-2 pm that day. Note however, THERE IS NO SPECIFIC EVENT PARKING AVAILABLE for this open house event. If you have questions about our open house, please contact ylva@unm.edu. In Albuquerque, the coverage of the Sun will be 73%. The eclipse will start at 10:21 am, peak at 11:45 am, and complete at 1:13 pm. What exactly is a total eclipse of the Sun? It's when the Moon gets between the Sun and the Earth and covers up the Sun. It just so happens that the Moon and the Sun, as seen from Earth, are the same size in the sky. So if the two are exactly lined up, the Moon can hide the entire Sun from our sight. When this happens, the sky goes dark and the faint outer layers of the Sun become visible – making a beautiful ring of light around the edge of the dark Moon. Where will the eclipse of 2017 be visible? To see the total eclipse, you must be standing right in the dark shadow of the Moon. The path of the shadow will only be about 60 - 70 miles wide, so you have to be in just the right place. The shadow spot begins its passage across the U.S. in western Oregon, and then crosses parts of Idaho, Wyoming, Nebraska, Kansas, Missouri, Illinois, Kentucky, Tennessee, Georgia, and South Carolina. A less spectacular partial eclipse, where the Moon "takes a bite out of the Sun," will be visible throughout the U.S., much of Canada, Mexico, plus Central and upper South America. In the San Francisco Bay Area, about 75% of the Sun will be covered. How long with the total eclipse last? The exact cosmic line-up that forms the total phase this time will last a maximum of 2 minutes 40 seconds (exact time depends on your location.) Also, remember that for you to see the eclipse, the sky must be clear. If clouds hide the Sun, you'll miss all the fun. So selecting the spot for viewing also means paying attention to the history of August weather in each location. Are eclipses of the Sun dangerous to watch? If I miss this eclipse, when is the next US one? The next eclipse to go through the continental US will be in 2024. It will go through a different set of states than the one in 2017. Where can I learn more about this eclipse? 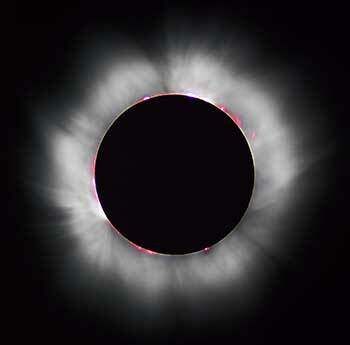 Go to nsta.org/solarscience and click on the link for a free 8-page intro to the eclipse. Also see: eclipse2017.nasa.gov and greatamericaneclipse.com which has good maps. A new children's book on eclipses, When the Sun Goes Dark, by Andrew Fraknoi and Dennis Schatz, has just been published by the nonprofit National Science Teachers Association and is available from them and Amazon. This is text provided via the Astronomical Society of the Pacific as a part of the American Astronomical Society Astronomy Ambassadors program.